The dissolution of the union between Norway and Sweden was carried out by the Stortinget (Norwegian parliament) under the House of Bernadotte on 7 June 1905. 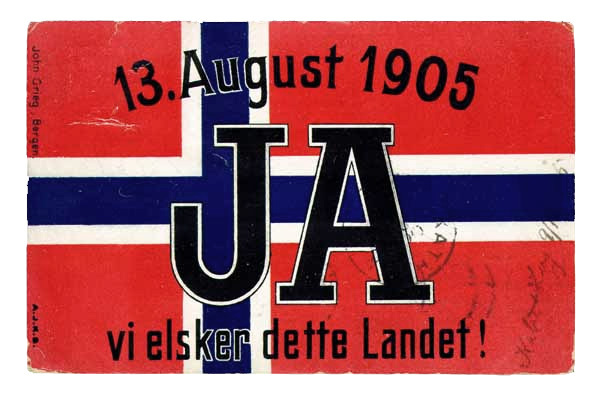 After some months of tension and fear of war between the two neighbouring nations, negotiations between the two governments led to Norway’s recognition by Sweden as an independent constitutional monarchy on 26 October 1905. On that date, King Oscar II renounced his claim to the Norwegian throne, effectively dissolving the United Kingdoms of Sweden and Norway. This event was quickly followed by Prince Carl of Denmark’s accession to the Norwegian throne on 18 November the same year, taking the name Haakon VII. Norwegian nationalistic aspirations in 1814 were frustrated by Sweden’s victory in a brief, but decisive war that resulted in Norway entering into a personal union with Sweden. The Norwegian constitution was largely kept intact, allowing for an independent Norwegian state with its own parliament, judiciary, and executive powers. Foreign relations were, however, conducted by the King through the Swedish ministry of foreign affairs. There were largely feelings of goodwill between the two peoples, and the common Kings generally tried to act in the interest of both Kingdoms. However over the years, a divergence of Norwegian and Swedish interests became apparent. In particular, Norwegians felt that their foreign policy interests were inadequately served by Sweden’s ministry of foreign affairs. There were several driving factors behind the growing conflict: Norway’s economy was more dependent on foreign trade and therefore more sensitive to the protectionist measures the Swedes were adopting. Norway had an affiliation with the United Kingdom; Sweden had an affiliation with Germany. Swedish King Oscar II’s disappointment with Norway had reached critical mass – calling for the excommunication of Norway and the later celebration of 12 May throughout Sweden. Norway had greater interests outside Europe than Sweden. In addition, Norwegian politics were increasingly dominated by liberal tendencies characterized by the growth of Parliamentarism, whereas Swedish politics tended more toward the conservative, with the king exercising greater discretionary political power. When free trade between the countries was restricted in 1895 through the abolition of the “Interstate laws” (Mellomrikslovene), the economic reasons for the continued union were also diminished. The conflict came to a head over the so-called “consul affair,” in which successive Norwegian governments insisted that Norway establish its own consular offices abroad rather than rely on the common consuls appointed by the Swedish foreign minister. As the long-standing practice for the conduct of joint foreign policy had been that a Swede always hold the office of foreign minister, the Swedish government and king rejected this insistence as an abdication of the throne’s right to set foreign policy. While Norway’s Liberal Party had pioneered an uncompromising position through the so-called “fist policy,” the Conservative Party also came to adopt a strong policy in favour of at least de facto independence and equality within the personal union. Although both parties made efforts to resolve the issue through negotiations, Norwegian public opinion became gradually more entrenched. Both Sweden and Norway increased military expenditures. Norway modernized the frontier forts at Kongsvinger and Fredriksten and built a series of new forts along the border.